Giardiasis, caused by the flagellated protozoan Giardia lamblia, is a common waterborne disease, but it can also be transmitted person-to-person. Cryptosporidiosis is another waterborne disease that is also transmissible person-to-person, but it is caused by a coccidian member of the Apicomplexa that multiplies within intestinal epithelial cells. There is no satisfactory treatment. Cyclosporiasis is a similar disease, but it is not transmissible person-to-person and it can be effectively treated. Amebiasis is caused by an ameba that ulcerates the large intestinal epithelium, resulting in dysentery. ■ Explain why person-to-person spread does not occur in cyclosporiasis. 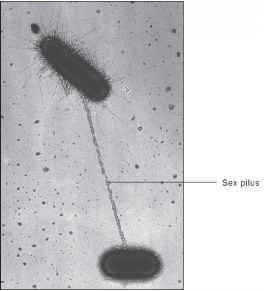 ■ Explain why individuals with severe giardiasis often have bulky feces containing fat. ■ Would you expect an individual with giardiasis who has diarrhea to be more likely to transmit the disease than an individual with giardiasis who does not have diarrhea? Explain. 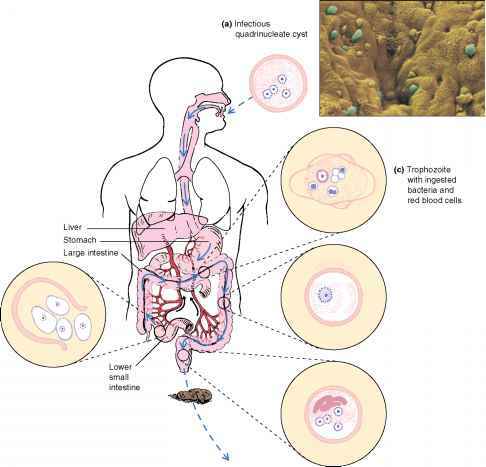 Figure 24.24 Life Cycle of Entamoeba histolytica Quadrinucleate cysts enter the mouth (a) and pass through the stomach to the lower small intestine (b). Four daughter protozoa are released from each cyst and develop into trophozoites (c), the feeding form (d). Dehydration in the large intestine stimulates progressive stages of cyst development (e). Mature cysts are passed in the feces to contaminate soil, water, hands, and food.Trophozoites that burrow into intestinal blood vessels can be carried to the liver or other organs, causing abscesses.The electron micrograph shows amebic cysts and trophozoites on bowel mucosa.